The quality of our products and our customers’ satisfaction are our priorities. We put our best foot forward to meet your expectations. Our work is assured by a life-long guarantee for our products. This gives you the certainty that you have made the right choice, while we are satisfied with our cooperation and draw a sense of a successfully accomplished mission towards our customers. 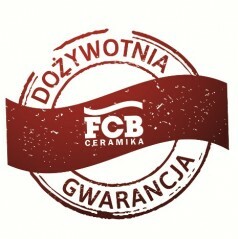 Copyright © 2019 FCB Ceramika. All Rights Reserved.